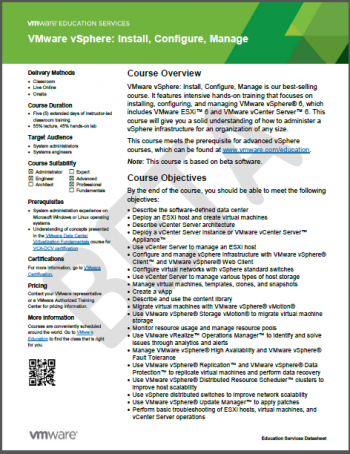 VCP6-DCV preparation class. Folks with a nearer expiration date may be relieved about yesterday's VCP recertification deadline extension. For folks new to VMware vSphere and jumping right in at vSphere 6.0, the sign-up for the new class to help you prepare to pass the VCP6-DCV certification is now available, with warnings it's based on the beta. One would guess that'll change soon, now that vSphere 6.0 was released. And as is likely still the case, it's expected that you spend many (dozens or even hundreds) of hours practicing in a lab, before you attempt to take, and pass, the VCP6-DVC test. This post is not focused on prep materials links or general advice, it's just an FYI about a new education opportunity, for those interested. There's also some good details in the Course Datasheet, seen pictured at right. Several of my wordwide IBM colleagues and I are honored to be taking VMware vSphere: Install, Configure, Manage [V6], the Live Online version, this week! We're on day 4 today, and it's 9am-5pm all 5 days of this week. So stoked about this. Our instructor is Javier, Just one more esxi-guy. Given our willingness to use the beta (documentation and materials), we're able to be a part of this awesome "early access" training opportunity, and I'm aware what a privilege this is. Global Knowledge offers the same class, for the same price, also starting in mid April, 2015.